Life is not always fair. It simply is not. There is tragedy, there is comedy and finally there is making peace, cause frankly sometimes thats all that one can do. Make peace. Find peace. Like Ivan Dmitritch Aksyokof. Its one of those pieces of fiction that will need a box of tissues to go with. IN the town of Vladímir lived a young merchant named Iván Dmítritch Aksyónof. He had two shops and a house of his own. Aksyónof was a handsome, fair-haired, curly-headed fellow, full of fun, and very fond of singing. When quite a young man he had been given to drink, and was riotous when he had had too much, but after he married he gave up drinking, except now and then. It was not Aksyónof’s habit to sleep late, and, wishing to travel while it was still cool, he aroused his driver before dawn, and told him to put in the horses. Then he made his way across to the landlord of the inn (who lived in a cottage at the back), paid his bill, and continued his journey. When he had gone about twenty-five miles, he stopped for the horses to be fed. Aksyónof rested awhile in the passage of the inn, then he stepped out into the porch and, ordering a samovár to be heated got out his guitar and began to play. Aksyónof looked, and seeing a blood-stained knife taken from his bag, he was frightened. Aksyónof swore he had not done it; that he had not seen the merchant after they had had tea together; that he had no money except eight thousand roubles of his own, and that the knife was not his. But his voice was broken, his face pale, and he trembled with fear as though he were guilty. 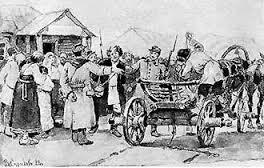 The police-officer ordered the soldiers to bind Aksyónof and to put him in the cart. As they tied his feet together and flung him into the cart, Aksyónof crossed himself and wept. His money and goods were taken from him, and he was sent to the nearest town and imprisoned there. Enquiries as to his character were made in Vladímir. The merchants and other inhabitants of that town said that in former days he used to drink and waste his time, but that he was a good man. Then the trial came on: he was charged with murdering a merchant from Ryazán, and robbing him of twenty thousand roubles. His wife told him that she had sent a petition to the Tsar, but that it had not been accepted. Aksyónof did not reply, but only looked downcast. ‘So you, too, suspect me!’ said Aksyónof, and hiding his face in his hands, he began to weep. Then a soldier came to say that the wife and children must go away; and Aksyónof said good-bye to his family for the last time. And Aksyónof wrote no more petitions; gave up all hope, and only prayed to God. Aksyónof was condemned to be flogged and sent to the mines. So he was flogged with a knout, and when the wounds made by the knout were healed, he was driven to Siberia with other convicts. 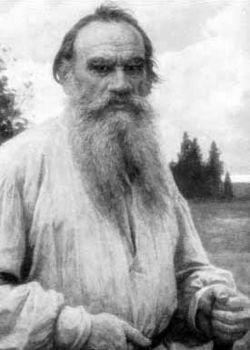 For twenty-six years Aksyónof lived as a convict in Siberia. His hair turned white as snow and his beard grew long, thin, and grey. All his mirth went; he stooped; he walked slowly, spoke little, and never laughed, but he often prayed. The prison authorities liked Aksyónof for his meekness, and his fellow-prisoners respected him: they called him ‘Grandfather,’ and ‘The Saint.’ When they wanted to petition the prison authorities about anything, they always made Aksyónof their spokesman, and when there were quarrels among the prisoners they came to him to put things right, and to judge the matter. One day a fresh gang of convicts came to the prison. In the evening the old prisoners collected round the new ones and asked them what towns or villages they came from, and what they were sentenced for. Among the rest Aksyónof sat down near the new-comers, and listened with downcast air to what was said. One of the new convicts, a tall, strong man of sixty, with a closely-cropped grey beard, was telling the others what he had been arrested for. ‘Where are you from?’ asked some one. ‘What sins?’ asked Makár Semyónitch. But Aksyónof only said, ‘Well, well — I must have deserved it!’ He would have said no more, but his companions told the new-comer how Aksyónof came to be in Siberia: how some one had killed a merchant and had put a knife among Aksyónof’s things, and Aksyónof had been unjustly condemned. ‘Perhaps you heard who killed the merchant?’ asked Aksyónof. He felt terribly unhappy, and all sorts of images rose in his mind. There was the image of his wife as she was when he parted from her to go to the fair. He saw her as if she were present; her face and her eyes rose before him; he heard her speak and laugh. Then he saw his children, quite little, as they were at that time: one with a little cloak on, another at his mother’s breast. And then he remembered himself as he used to be — young and merry. He remembered how he sat playing the guitar in the porch of the inn where he was arrested, and how free from care he had been. He saw, in his mind, the place where he was flogged, the executioner, and the people standing around; the chains, the convicts, all the twenty-six years of his prison life, and his premature old age. The thought of it all made him so wretched that he was ready to kill himself. ‘And it’s all that villain’s doing!’ thought Aksyónof. And his anger was so great against Makár Semyónitch that he longed for vengeance, even if he himself should perish for it. He kept repeating prayers all night, but could get no peace. During the day he did not go near Makár Semyónitch, nor even look at him. A fortnight passed in this way. Aksyónof could not sleep at nights, and was so miserable that he did not know what to do. One night as he was walking about the prison he noticed some earth that came rolling out from under one of the shelves on which the prisoners slept. He stopped to see what it was. Suddenly Makár Semyónitch crept out from under the shelf, and looked up at Aksyónof with frightened face. Aksyónof tried to pass without looking at him, but Makár seized his hand and told him that he had dug a hole under the wall, getting rid of the earth by putting it into his high-boots, and emptying it out every day on the road when the prisoners were driven to their work. That night, when Aksyónof was lying on his bed and just beginning to doze, some one came quietly and sat down on his bed. He peered through the darkness and recognized Makár. Makár Semyónitch did not rise, but beat his head on the floor. ‘Iván Dmítritch, forgive me!’ he cried. ‘When they flogged me with the knout it was not so hard to bear as it is to see you now . . . yet you had pity on me, and did not tell. For Christ’s sake forgive me, wretch that I am!’ And he began to sob. ‘God will forgive you!’ said he. ‘Maybe I am a hundred times worse than you.’ And at these words his heart grew light, and the longing for home left him. He no longer had any desire to leave the prison, but only hoped for his last hour to come. In spite of what Aksyónof had said, Maker Semyónitch confessed his guilt. But when the order for his release came, Aksyónof was already dead.